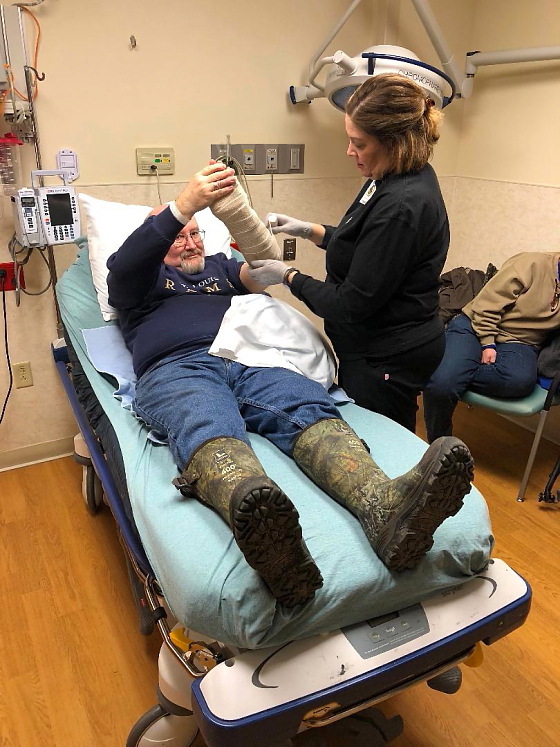 My buddy Danny McClendon in the ER after an unfortunate slip on the ice at LaBarque Creek Conservation Area. My friend Danny and I met at sunrise Saturday morning for a hike out to Hole-In-The-Roof Falls at LaBarque Creek Conservation Area. We were eager to see what kind of ice formations had developed following all of the rain and cold weather we’ve had in recent weeks. We both decided to wear rubber boots because we knew we would be doing some wading in icy creeks but as we pulled them on we discussed the merits of rubber boots vs hiking shoes with regard to traction on ice. Little did we know that our conversation was an omen of things to come as we headed down the trail. It wasn’t long before we ran into sheet ice on the bedrock outcroppings along the trail. Rather than walk across the ice, we simply continued off trail past those sections in the leaf-littered woods. About that time, I started asking Danny how his knee felt because I knew he had had some recent swelling since the knee was surgically repaired several months ago. “It’s fine,” he said, reminding me that we had already taken a seven-mile hike following the surgery a while back. I knew I sounded like a mother hen but I sure didn’t want to see him slip and wrench that knee! Once we managed to get Danny up off the ice and in a seated position we saw that his wrist was swelling fast. His binoculars looked fine, by the way, which wasn’t a good sign. I still have an image of Danny moving his wrist a little and saying he could feel something crunching in there. Yikes! About half-way back to the car, Danny was beginning to feel the pain as the swelling continued, along with the jostling across creeks and up and down the trail. I was terrified he might fall again — then what? Of course Danny just repeated along the way, “I’m sorry you didn’t get to photograph the falls.” He must have been a little delirious! By the time we made it back to the parking lot and then Eureka, Danny’s wife Eileen was waiting for us. Eileen was all business, just as Joyce would have been. No time for stories and excessive sympathy. Let’s get my fella to the hospital! We managed to get Danny’s expensive hunting jacket off before they departed because we knew they would cut it off at the hospital. The next stop was the ER at Mercy Hospital in Creve Coeur. Later that morning, when I was allowed in to visit Danny, he and Eileen informed me that he had indeed broken both of the bones in his forearm. Hopefully, he will be ready for turkey season by the end of his 4 – 6 week recovery. The accident was a good reminder of how fast things can go south on a hike. I only recently took a hard fall in Arkansas when I was 3.5 mile down the trail with a drop of 1500 feet in elevation. I have to wonder, had I broken a bone, if I could have made it back to the trail head. While we were in the ER, I said, “At least you didn’t get a $40,000 helicopter ride, Danny.” When I added that I would rather die than be on the hook for one of those rescue flights, the nurse looked at me and cracked up. It was a nice ice-breaker for us all, no pun intended. Many thanks to the wonderful staff at Mercy Hospital in Creve Coeur, including the nurse in the photo. Professionalism is a soothing elixir for those in pain. America is beautiful. I vote to keep it that way. Enter your email address to receive notification of each new post.